Hi! Today both of us are going to share wth you our testimony on giving. At first, we told her we wanted to give some money to mum and dad, some to church building fund and save the rest. She told us that whatever we plan to give to our parents will go to the church building fund because they want to see our church be debt free quickly. 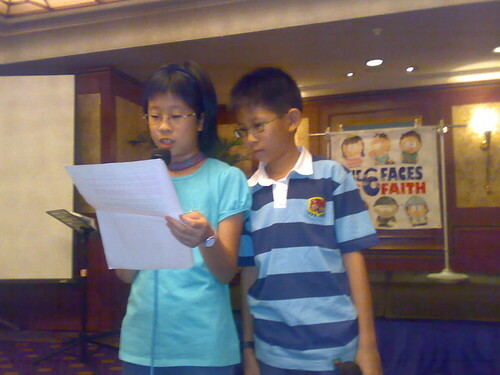 Our mother told us to consider giving all our hongbao collection to the church building fund, only if we are willing. Deborah and I discussed and finally decided to just do one thing: that is to contribute all our hongbao money towards reducing the church debt. “When you give, you feel a little sad because what you have given up is no longer yours. But on the inside, you experience the real joy of giving.” I feel that is true. Giving is seldom easy, but when you give with a willing spirit, you will feel true happiness. We would like to encourage you to give generously more often. We hope you will learn something from our testimony. This is a form of self-actualization. Like a cup fill with half the water. Negative people see lack and hoard for it, their mind stop thinking and say I can not afford it. Positive people see the need to fill and know where to get more, they start thinking how can I afford. Money give you more options. Without money, God still give more option. He have plan to prosper you (he did not say he give money to prosper you). Because He know if He give you a fish, it can fed you for a day. If He teach you how to fish, He will fed you for a lifetime. So He says in Matthew 4:19, I will make you fishers of men.